To the lady in the red blouse shopping at The Fresh Market last Thursday: Please forgive me for scaring you. I was that crazy woman with the rain-frizzled hair who startled you by yelling “Yes!” over your shoulder as you were bagging your asparagus. I’m really not that dangerous. Ask anybody (well, maybe not the man by the organic strawberries). It’s just that I’ve been waiting so long for asparagus prices to come down from the stratosphere, and when I saw that $2.79 price tag, I couldn’t control myself. I will take your advice and seek help (or maybe just an extra helping of roasted asparagus). To my readers: I scared a stranger and deprived my family in order to bring this recipe to you. I hope you’re happy! 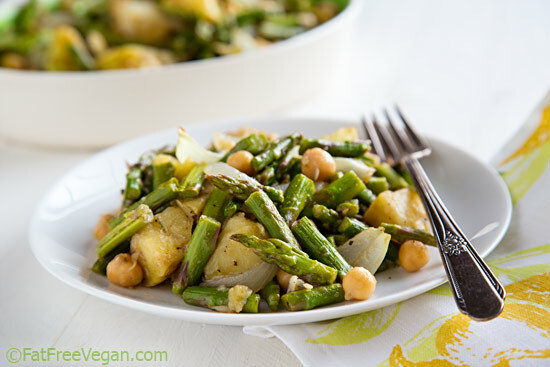 Delicious warm or cold, this hearty, vegan asparagus salad makes a great one-pot meal or side dish. Cook the potatoes until tender but still firm in any way you choose (boil, microwave, or bake). Allow to cool slightly and cut into 1-inch dice. Place in a large serving bowl along with the chickpeas. While the potatoes are cooking, spread the asparagus on a baking sheet and sprinkle the onion over it. In a corner of the sheet, place the unpeeled garlic cloves. Roast until asparagus is tender yet still crisp, about 15 minutes, stirring once after 7 minutes. Remove from oven. Set the garlic aside to cool for a few minutes and put the asparagus into the bowl with the potatoes. When the garlic is cool, peel it and place it in a small bowl. Mash it well with a fork; then stir in the salad dressing. Pour the dressing over the asparagus and stir gently to combine. Season to taste with salt and pepper. Makes 2 large, one-pot meal servings or 4 side servings. Nutrition info below is based on 2 servings; divide figures in half for 4 servings. Hilarious. I love this recipe. It looks so delicious. I’m going to try it out for dinner tomorrow. **bookmarked! I have also waited for this low price therefore I could buy for my weekly menu. This is so delicious. I added chopped parsley and chopped curly kale and a few sliced kalamata olives. I just used regular balsamic vinegar mixed with the garlic, a bit of oregano and a little potato. I should have added a few red pepper flakes. This one is a real keeper – thank you so much!!! Whoa that sounds (and looks) good. I am about to head out to the store right now, thanks for this recipe and all of the others. This dish is so addictive! I’ve made it three times since you’ve posted it! The last time I made the potatoes and chickpeas a day ahead and later realized I had no asparagus! : O Oh no! Someone had eaten it all (probably me…). I subbed Brussel’s sprouts and forgot to add the dressing. It was surprisingly delicious, despite the changes, and very Irish! Loved this recipe. I made it with purple potatoes instead of yukon golds last night and it was super yummy and very filling. I have never roasted and mashed garlic like that before, it made me feel like a gourmet vegan chef!!!! This came out very good even with a few substitutions for ingredients I had on hand( different type of potato, vinegar etc.). But when I ate it cold the next day, it seemed to improve its flavor far more than even most better-the-next day recipes and became really yummy! First recipe I’ve tried on this site. REALLY exceptional. Love the combination of vegetables and beans! Definitely use the Balsamic-Raisin dressing. Thanks so much! William Carlos Williams is my favorite American poet. 🙂 And SO appropriate that yours was about ASPARAGUS! I bought two bunches the other day (it was on sale for 99 cents a pound!) and made one for me and one for my husband, remarking, “can a vegetable be like crack to a person?” We gave a few spears to our children but kept most to ourselves… it seems like they want it more when we act like it’s a grown-up delicacy, ha! As I was just looking through your recipes, I realized how many of them I’ve made and enjoyed over the last 15 months of plant-based eating. Your meals have graced our table at least two or three nights each week. You’ve helped make this adventure delicious, nutritious and fun for my family! Thank you for your generosity in sharing your work with us! I made it “as-is” the first time and…yum! The second time I roasted a red pepper alongside the potatoes and mushrooms with the asparagus. I diced the pepper and quartered the mushrooms – I really liked the flavor and texture both of these added. Your blog has been a lifesaver since my husband went vegan about a year ago! My picky 5 year old even eats many of your recipes! I roasted the potatoes, then when they were almost done added the asparagus and onions. A couple of minutes before taking out of the oven I added the garbanzos to the pan, to heat them. After taking out of the oven I tossed the veggies and beans with dressing ( homemade roasted garlic balsamic vinaigrette, my version of a Moosewood recipe) and scooped it over fresh spinach (from our garden) on our plates. My husband’s comment was that it is a keeper. Very nice easy dinner for a rainy and cold Montana spring evening. Thanks. Just made this yesterday and it was GREAT. I love the roasted garlic in the dressing. Thanks a lot! This was really very nice! I added all of the variations and my husband (the omnivore) and I really enjoyed it for lunch. Thank you! That roasted garlic….yum! I doubled it and used a fat free, dairy free ranch dressing instead of the Balsalmic. I am in love with this salad! Thanks so much! This sounds wonderful! I’m making it in advance for a work party tomorrow. Should I wait to add the salad dressing until right before lunch? I’m trying to work my way through your recipes, one at a time. But it may take a lifetime, because I keep going back and making favorites over & over like this asparagus salad. We love it because it is easy & tasty & healthy! Thanks, Susan. I made this salad tonight and didn’t have raisins so I used craisins. It is a easy dish and will be making it again. Thanks, love your site. Susan, I’ve been wanting to make this dish since you posted in a year ago, and am soooo sorry I waited so long. It was absolutely delicious — my husband, who isn’t an asparagus fan, raved about it, and wanted to know WHEN I was making it again! We’re both attempting to follow the Eat to Live plan, and I think we’d starve to death if it weren’t for your website, since the Fuhrman recipes aren’t particularly friendly to people who need to pull dinner together after a long workday. Thanks so much for so many fabulous meals and ideas! Glad to be reminded of this recipe from your latest newsletter. Made last year (twice, brought to a party and loved so much I made again). So easy and very “Spring-y”. All the best as you continue your recovery! Loved this! For added interest, I included some golden raisins since they were in the dressing and sunflower seeds. Gorgeous, vibrant, healthy salad. Will make this again for sure. Thanks! 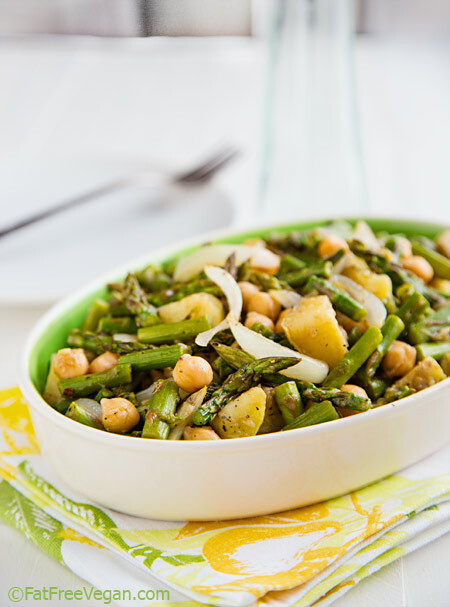 I have red potatoes, fresh asparagus, et al, and plan on grilling the veggies to make this side dish today. Made your Balsamic Raisin Dressing just now. Can’t wait! thank you Susan! Another WONDERFUL recipe!!!! A keeper for sure! I used 6 Yukon Gold potatoes and 2 bunches of asparagus for the 2 of us and there was only a little left over. I used your raisin dressing, but instead of raisins I used a few dates, different vinegars, added a squirt of Dijon, and left out the lemon juice. I tend to love Dijon vinaigrettes with potatoes, asparagus and artichokes, so this was perfect for my taste. Yet another wonderful recipe, thank you so much for sharing these. I would send you flowers if I knew your address!